Pictured here is the MOSSAR Color Guard Team on Veterans Day 2008. The MOSSAR Color Guard team participated in the Veterans Day event located at the Vietnam Memorial in Kansas City, MO, which honors veterans of the Vietnam conflict. 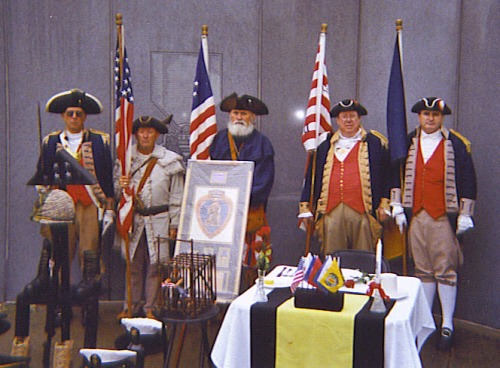 (L-R) Major General Robert L. Grover, MOSSAR Color Guard Commander; Compatriot J. Frank Shouse, Compatriot Francis R. Roberson Jr., Captain James L. Scott, and Compatriot Dirk A. Stapleton.